Art, primary painting skills revealed and drawing. Art, primary painting skills revealed. Why all great painters draw? Look, look and look more. The basic ingredients for both drawing and painting are the same, both skills are firmly based in making marks that are representations of the subject matter and are closely interconnected when practiced. The most important factor in practicing both skills is the ability to see, seeing is everything not just seeing the object or subject matter but also the image being translated onto the workspace. Many works of art are a combination of the intentional and the unintentional because great artists always take full advantage of what has been forever termed as happy accidents which do not happen unless you discipline yourself to look very hard. How can you translate an image if you can’t see because you are not looking? You can’t. The very best advice I can give to anyone wanting to learn to paint is to draw as well in order to develop your manual dexterity with the tools you use and your observational skills at the same time because this will inform everything you do. The most important difference between drawing and painting is most often that drawing develops your understanding of line and tone with painting taking that knowledge further into areas of color and tone. This is important for translating the information onto the two dimensional surface in order to create a three dimensional illusion. Understanding the relationship between line, mark making, color and tone is the essential knowledge you will gain from practicing both disciplines. These very same disciplines carry over into all visual arts and have always had a long standing relationship with music. Here's an example of usage. 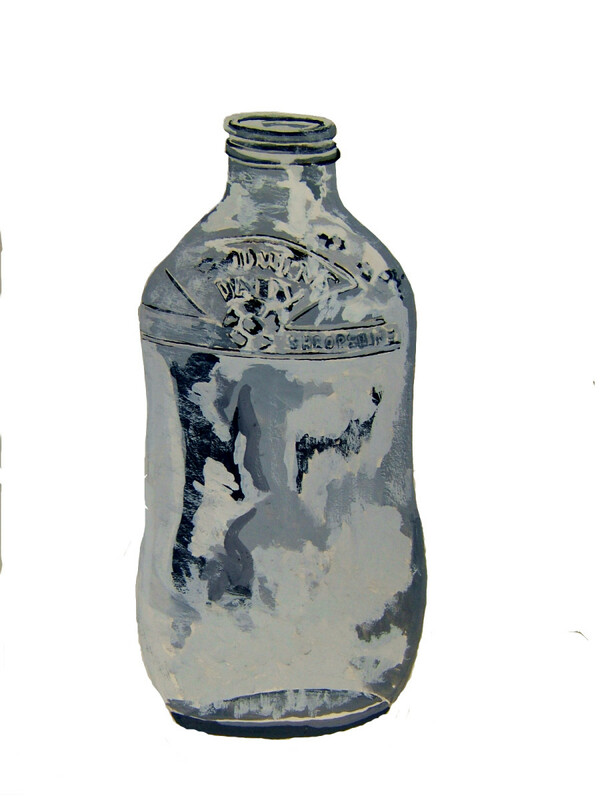 A good old Shropshire dairy's glass milk bottle, better than plastic to paint with black and white gouache. For those who want to paint we salute you. So the best place to start is with a drawing because this will also inform your painting to help you develop your own techniques and style. There is no set way to paint or draw we are all individual with our own unique abilities. If you start out with simple shapes or objects you will soon develop the confidence to become more adventurous with your growing scientific knowledge gained from your experimental testing of your own skills and ability. This is what you do to begin the process you have four weeks to complete this task this will give some understanding of tone using thick paint it will give you your fist experiments with paint. A tube of white water based thick paint and also some black this could be Gouache, Poster paint, Acrylic or what ever you can get your hands on. You could even try some household gloss paint if you wanted to suffer the fumes and corrosive chemicals. The decision is yours but I would settle for Gouache because I am boring. Find some objects to paint, look for objects that are shiny, reflective but simple in shape, objects of that nature reflect the light and so also help you to define the shape by looking at the tonal variations to enable this learning by looking. 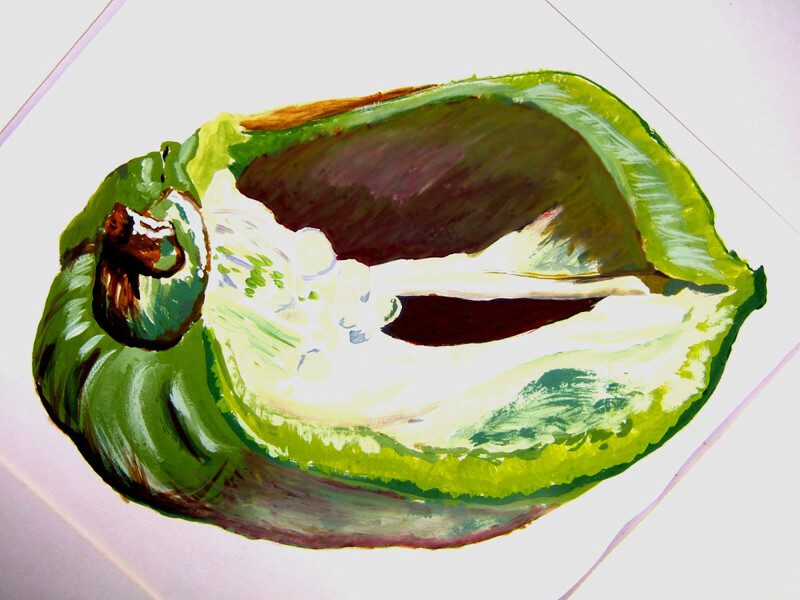 A green pepper in colour, done with thick paint and no black from a tube, painted with mixed paints using primary colours only and the white of the paper. These are not simple shapes but are an example of what you can do with the information about how thick paint can be applied with water colour washes to great effect and presision. Both paintings above and bellow are examples of using Gouache which is a very versatile painting material that can be used in many different ways it can be used in its natural state as a think paint or watered down to be used like water colour. Both paintings are an example of Gouache being used in this way as both thick paint and water colour. The heavy black marks in the greyscale painting of the woman's face are made using the think paint method with the Gouache being slightly watered down for fluidity the lighter marks or tones are an example of using this with a very watered down consistency. When the paint is in this state it is very fluid but also more translucent allowing the white of the paper to come through creating a lighter tone. The painting of the woman's face is an excellent example of how gouache can be used as water colour showing also a wide variety of marks and tonal variation. 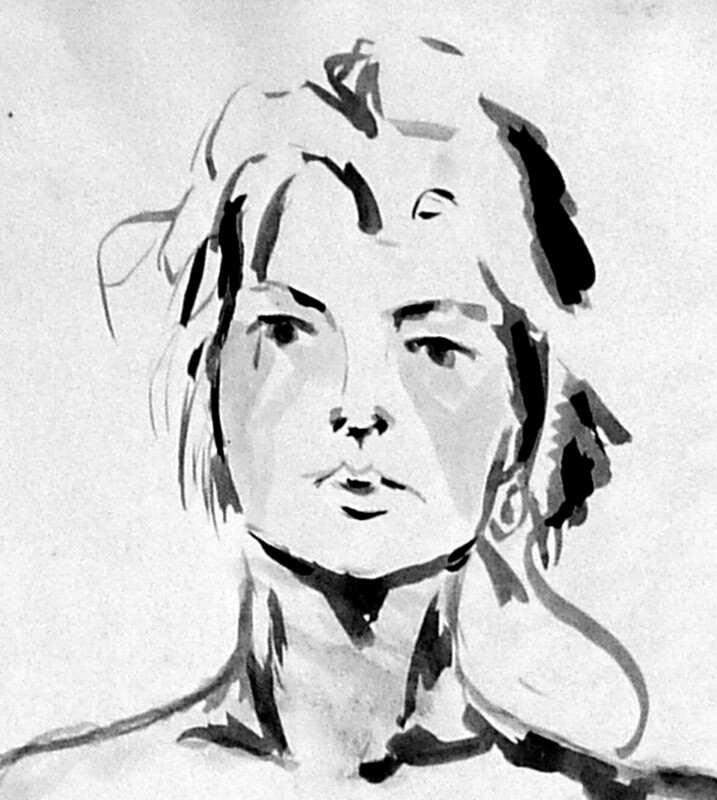 A life drawing/painting created with gouache, thick paint and washes of grayscale tones, a nice example of mark making with a flat brush showing how the brush can be used to lay down think and thin lines. 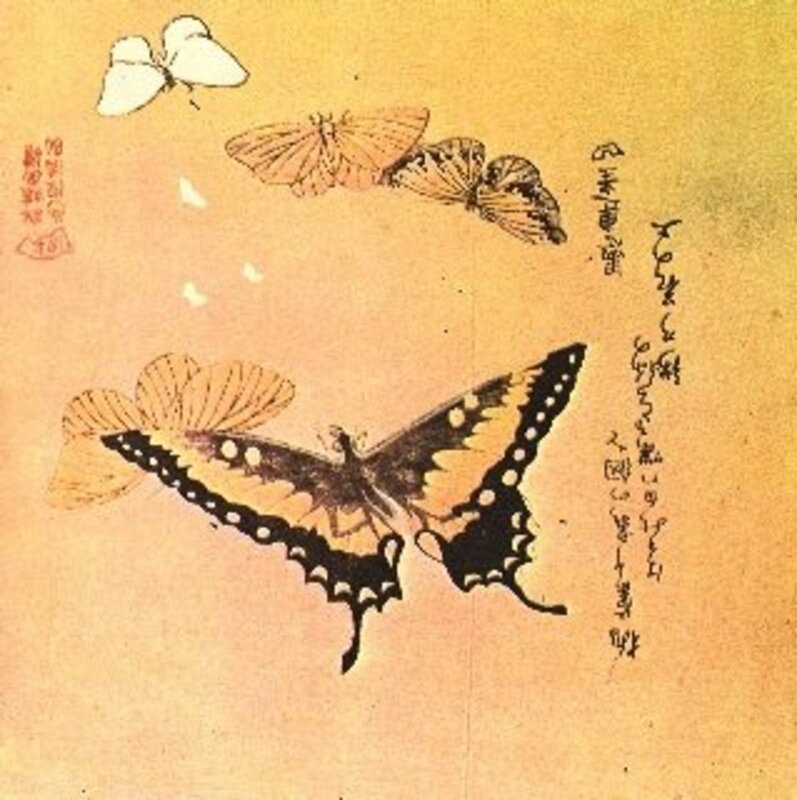 The paining below is an example of how you can use both techniques, thick paint and wet into wet water colour washes as in the sky colours, and tonal values . The trees and foliage use both thick paint as dabs to create leaf shapes or marks, and other more lighter colour or tones are made with washes of very watered down paint. Thus making it very light in tonal value creating the effect of different values of light in the leaves appearing to be shining in the daylight. 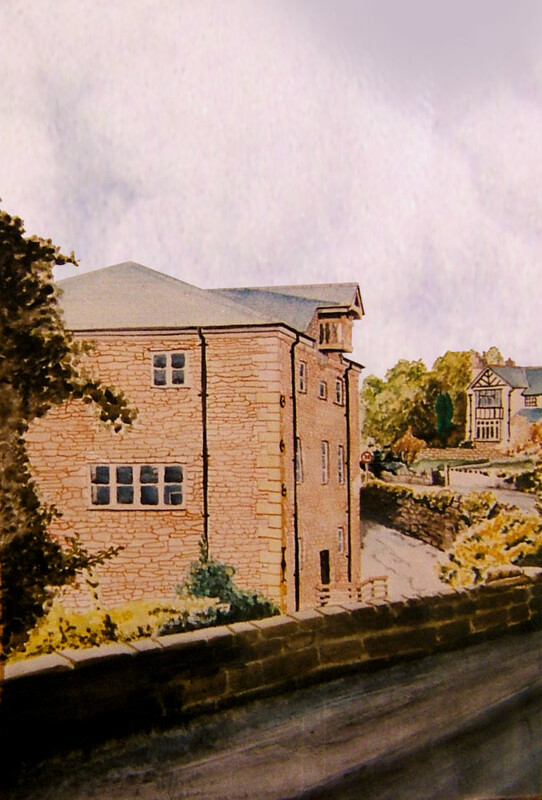 Kings Mill on the Old Road to Wrexham, North Wales, UK, painted using a variation of differing techniques with water colour washes, wet into wet and thick paint to create the many different components of this picture. The only way to paint is to actually paint, you see when a person actually takes part in there own learning they actually retain as much as 90% of the information that they generate themselves. That is why hands on experiential learning is the very best you can get and no mistake. Other useful links to visit. Child Portrait drawing is the stage by stage depiction of creating a child portrait. You can see it grow from the very basics to the finished, end result. See it develop right in front of your eyes. Hey Peggy W, don't they just, that's why they use music in films because it sets the mood but also helps to put you inside your own head, keeps your attention from dare I say it, reality. When painting or drawing, music helps me have dreams that are like food to the creative engine. Like I said the headphones keep the world out and me in. Thank you for the comment and vote, Gareth. I truly enjoyed looking at your art. You are very talented. I am a self taught artist for the most part. I enjoyed learning that you like to listen to music as you create. I love doing the same. Somehow the two seem to blend beautifully together. Up votes! Hi Mr.Happy, that house is a 17th century flower mill, built in the late 17th century to supply the estate on which it stands with flower for baking bread. I have painted that building at least 3 or 4 times. I often mark outlines before I paint but not always, sometimes I just dive right into it. Depending on what's to hand, if I can't lay my hands on a pencil, then I won't go looking for one, I just get on with it usually. I don't understand the scratchy noise from pencils, charcoal yes but not pencils, unless you are using very hard pencils, like H and upwards, which I never use. Soft pencils like 2B upwards are very nice to work with, very smooth and feel really nice when overlaying them on top of each other. They are made from graphite mixed with clay, which are both smooth substances, graphite is sometimes used as lubricant. You must be using hard pencils, which is little wonder you don't do much drawing or even try, to be honest I don't even know why the make them in the first place. I only ever use B grades really, B, 4B and 9B mostly and I often work with my head phones on playing music so would not hear very much of anything anyway really. I like working with Biro's, they run really smoothly, much like a soft pencil but you can't use an eraser with them, that's why I use them, to make me draw more accurately. If you don't like the noise wear headphones, listen to music because drawing/paining are related to music in some way I think. You are very welcome to the information and thank for your participation, it is useful, thank you again, BoGareth. 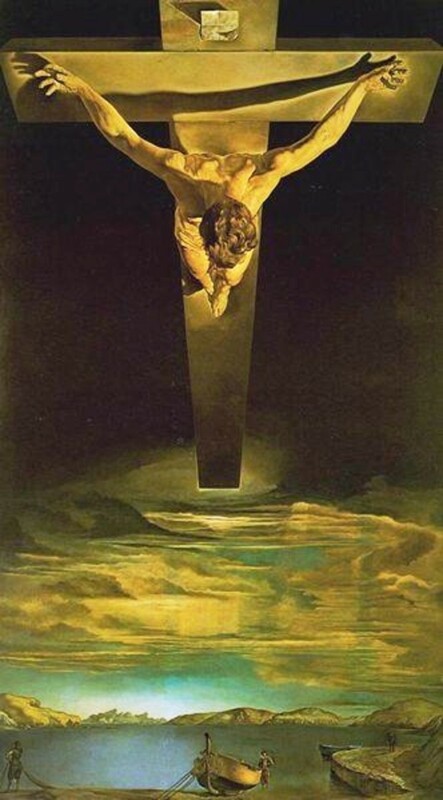 I love the last painting too. Looks simple from far but it is certainly far from simple. All those bricks on the wall of the house, the leafs of the trees ... patience ... I should try painting just to work on my non-existing patience. So, do You always draw in pencil before You paint? On a side-note, I so dislike the way pencils and charcol sound on paper - that scratchy noise eats away at this wolf's ears. Quite painful actually ... makes my hair raise-up ... When I write, I always use pens, for that reason. Thanks for all the great information! Cheers. Thanks for the supportive comment and all the very best, Gareth. You are a brilliant artist, I think you are able to translate your enthusiasm to this hub.Thanks !! Excellent work. I am an artist myself. Keep up the good work. Thanks for stopping bye, glad you where happy with the content, cheers. This is such a great hub. Thanks for sharing! Wow! That's my kind of art. Excellent job! This is a great hub, I was drawn to the painting of the bottle , it looks so good !!! Amazing description 1I think with this kind of insight about painting even a layman can start drawing ! I am happy this hub meets with your approval it is often difficult trying to put something to across to others because we can not always be sure it is being understood when talking to an empty space. That is why I am happy to receive feedback and grateful for the time you have taken to express it. PS. I took a look at some of your hubs to find them interesting, thank you again. Wonderful, inspiring, and informative hub on painting and drawing..I loved the way you expressed how you look and retain the image...it was so right on...glad to know another artist here...I love to paint,and especially to draw...you are really good! Thanks to you also and I am happy you enjoyed it. Great info in this hub. Thanks! Hi Guys, HeartHealth, Party Girl, Tom Cornett, thank you for the great comments and glad you liked it. Very good hub...I love all kinds of art! Thanks! You are a brilliant artist, I think you are able to translate your enthusiasm to this hub. Very good, 2 thumbs up! Very impressive realism! Strongly tempted to buy an art print~ ANY art print! Well, looking forward to your visiting my art glass and carnival glass hubs. Cheers!